As you arrive at the Cairo International Airport, you will be greeted by our representative who will assist you through the immigration and customs formalities. You will then be transferred by a deluxe coach to your hotel in Cairo for check-in and stay overnight. After breakfast at hotel , proceed for a day tour to visit pyramids area ( excluding entrance fees to look inside the pyramids ) , where you will see one of the Seven Wonders of the ancient world; the Great Khufu’s (Cheops) pyramid (2690 BC), continue to explore the rest of the Giza plateau including the sight of Khafre’s pyramid - Khufu's son, the second-largest pyramid on the Giza site; and Menkaure Pyramid the smallest of all three; all proudly guarded by the famous Sphinx. Which is famous for its antiquities from Egypt's pharaonic era, dating back 50 centuries, most famous of which is the Tutankhamen collection. 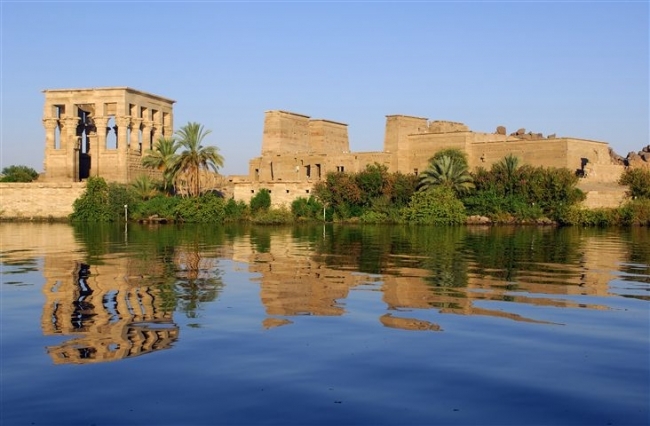 Visit west bank (valley of the kings, Hatshepsut temple of El Deir El Bahary & Colossi of Memnon ) , sail to Esna , and admire the beautiful scenery of the Nile while sailing to Edfu. , dinner and overnight onboard. All airport transfers, ground transportation, meals as stated in the program. Any extra expenses of personal nature such as drinks, tips etc.